What's a problem but an opportunity disguised as a stripper havin' a seizure on your boat? Maybe I’ll start blogging again. I’ve been doing most of my “work” on Facebook. I have a bit of a guaranteed audience for my mental flotsam. But why should Facebook have me thoughts. Maybe I’ll get the old band back together. I’m starting to get a little mental about knife sharpening. You may have noticed. Something I’ve completely ignored is stropping. Stropping. Stropping is the difference between getting a blade sharp, really sharp and razor sharp. And for the little bit of work that it takes to strop a blade, it is ridiculous not too. So this week I’m going to pick myself a piece of leather and make my own strop. If I can find some buffing compound, I’ll pick that up too. By the weekend, I’ll be stropping my knives. For this and the person that asked for a “tutorial” on how to use a strop, I’m going to give you just the basics. A leather or cardboard strop micro polishes and micro aligns a blade. Leather or cardboard are a very fine abrasive; much finer than most sharpening stones. So they sharpen the blade; really they polish it as they are so fine that they take off very, very little metal. Second, strops push the edge around as you use them. All stones do this too; that’s why burrs form. The strop pushes the edge around a small amount and can allow you to get your edge really straight up and down: Not pointed off to the left or right slightly. You can think of the edge of a knife as being made of clay. Pressure on one side will push the edge towards the middle, and with more pressure, will push it over to the other side. 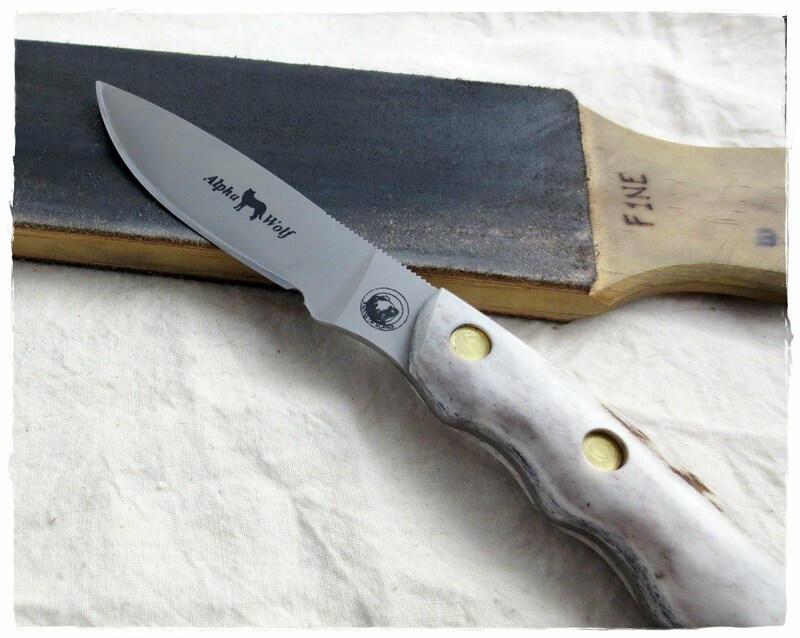 To use a strop you always use an edge trailing stroke. Or you can think of it as leading with the spine. Either way, the key idea is to NOT cut into the strop. Go the other direction with the edge trailing. What angle do you strop at? I’ve read opinions that the angle doesn’t matter all that much. To get an idea of the correct angle, put the blade flat on the strop and start moving it forward (edge first), slowly and gently. Raise the spine of the blade as you go, so the angle increases. At some point the blade will begin to bite into the strop. Stop right there. That’s the angle you want to strop at. But remember: You strop with the edge trailing. This edge forward was just to find the angle to strop at. Always strop with edge trailing strokes. I usually do 2 or 3 alternating strokes per side for a few rounds and check the blade to see if it is “leaning” one way or the other (a small burr on one side or the other). Then I strop 2 or 3 times, decreasing the pressure, on the side with the burr and check again. I repeat if necessary, or switch sides if necessary. Then I finish off with a dozen or so alternating strokes, trying to use just the weight of the blade for the last half, and at the very end, not even the entire weight of the blade. After checking at this stage, I sometimes have a (tiny) burr on one side and will have to touch it up. I’m still learning how to use the strop correctly. I can say that I can definitely improve most edges with a strop, but I can’t do the miracles that some here can like tree topping and hair whittling. Finally … if you rub buffing compound into the strop it will make it cut much faster and more effectively. Green chromium oxide compound seems to be the most popular, though others use other kinds, including exotic stuff like diamond paste. For the few dollars it costs for a big stick of green compound, I think it is VERY much worth it and it makes a big difference in the performance of the strop. This got longer than I intended, though as I said, I’m no where near an expert on stropping. I hope I got the basics correct and helped out those who are brand new to stropping. I’m just going to leave this here and pick it up later. It seems a good little primer on knife sharpening. Michael Pollan is a journalist. He’s written mostly about the things we eat and how & why we eat them. He has written the sanest, most easily digestible (pun intended) stuff on food and diet that I have ever written. In his books, he’s tickled important information out of our instincts & traditions, scientists & chefs, and grandmothers & great-grandmothers, and written them in easily read books and essays. 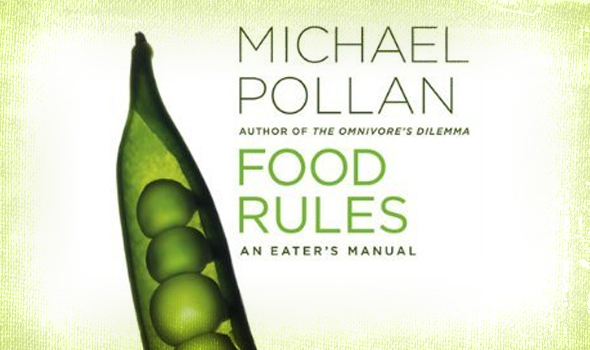 While Mr. Pollan has written eight food-related books, FOOD RULES might be his most important. Why? Because he gives us bite-sized (yes, another pun) chunks of advice, gleaned from all of his studies, on how and what we should eat. If we followed half of his advice, there is no doubt that we’d be healthier and happier. The list below includes every aphorism from the book. In the book FOOD RULES, each aphorism is accompanied by a mini-essay. Buy the book. Read the essays. Apply the advice. At least as much of it as you can. Eat more lie the French. Or the Japanese. Or the Italians. Or the Greeks. I bought a very cheap knife at the local flea market. $12. And I overpaid. I promptly brought it home. Sharpened it. And oiled it. I turned it into a workable, though still cheap, stiletto. And then promptly cut myself with it. Above you can see said knife and the subsequent field dressing. Maybe the wound could have used some professional attention. My 11-year-old certainly thought so. It did bleed a lot. Perhaps it deserved a stitch or two. But I just slapped on a little gauze and some athletic tape. I wonder whether the world is being run by smart people who are putting us on, or by imbeciles who really mean it.